Trim the stem under water or under running water. 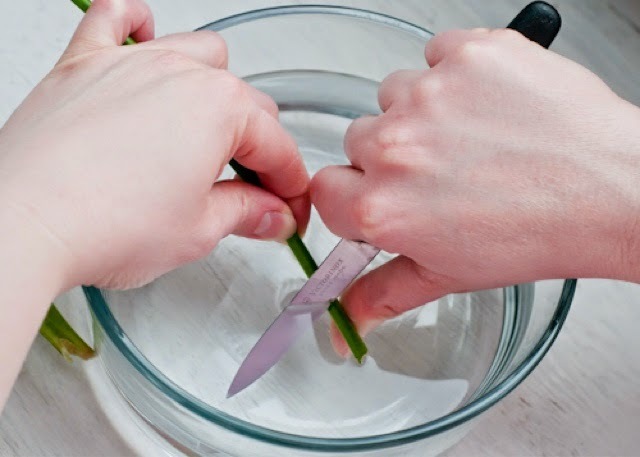 Trim the end of each stem with a sharp, non-serrated knife under water at 45-degree angle. Make sure to submerge it in water after trimming so as to avoid air pockets to form that can block the path of water into the stem. Never ever use scissors as it can crash the flower stem and can cause it to die quickly. Tip #1: When cutting flowers from the garden, do it early in the morning when the temperature is still cool. Then, place them in water immediately. Tip #2: To improve the life of flowers that ooze a milky “sap”, immerse its bottom by 2 inches in boiling water for 10 seconds before using them in an arrangement. Remove wilted petals and leaves. Read How You Can Keep Your Flowers Live Longer for more tips on extending the life of cut flowers, and find the freshest flowers online at zFlowers.com.